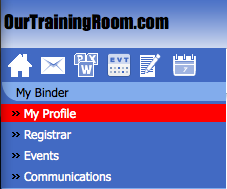 Contained within your profile, in addition to some basic personal information, is a complete snapshot of your training history going back as far as your account creation date. In order to access your profile, simply click on My Profile found within My Binder from the left hand menu as depicted above. Within, you will find a summary of your account details, including the login information associated with your account. Depending on your role and the settings established by your organization, you will have the ability to change this information should the need arise. At any point, you may reset the password by clicking on the applicable button to launch the password change wizard. Your Transcript will contain a full record of each and every Course, Communication, or Event that you have completed or attended and have yet to complete since your account creation. At any point, should you want to access this module, simply click on the module name or title to launch the content for review. Should you want to filter the history of training, you may search for a record by a keyword in it's title or you may further reduce list by the status of a particular item. The list can be reduced to only showing those items that are Complete, Incomplete, or All. 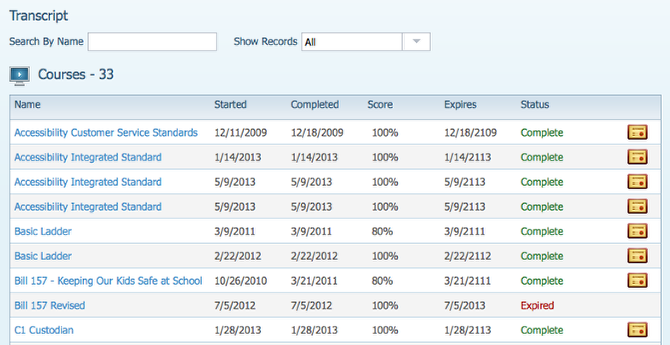 To print a full copy of your transcript, simply click on the printer icon as depicted above. Should the module be configured to provide a certificate of completion, an icon will appear on the corresponding row. To print a certificate, simply click on the certificate icon as depicted above. Previous Page: How do I access a Course?